Hadley Town Hall, 4 Stony Creek Road, Hadley NY 12835; phone: 518-696-3112. Photo: The Old Corinth Road Bridge, a two-span iron parabolic truss, was built in 1885 by the Berlin Iron Bridge Company, East Berlin, Connecticut to replace a covered timber bridge that crossed the Sacandaga River. Based on an 1878 patent granted to William O. Douglas of Binghamton, New York, its main span is the only extant half-through truss of the three known to have been built. The bridge represents a period of American bridge building when the shop-fabricated/field-erected metal truss was the dominant structural form of highway crossings in most parts of the country. Photographed by Jet Lowe, 1994, Historic Engineering Record [HAER NY-292], memory.loc.gov, accessed June, 2012. Hadley was formed from Greenfield and Northumberland, February 27, 1801. Corinth was taken off in 1818 and part of Day in 1819. It lies upon the Hudson, in the northeast corner of the county. 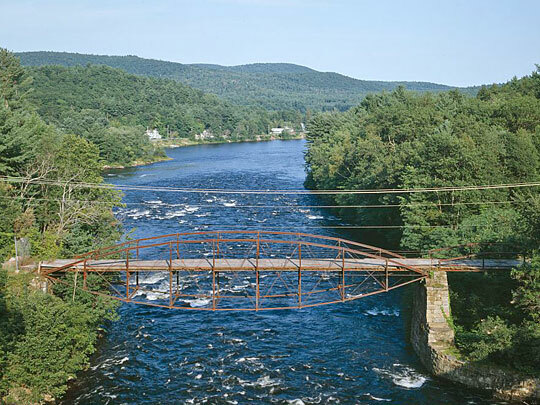 The Sacandaga River flows through the southern part of the town. The first settlement was commenced on the Hudson River soon after the close of the Revolution, by Richard Hilton. Alexander Stewart settled on the Hudson in 1788. In 1790, Elijah Ellis settled on the south side of the Sacandaga. The first school was taught in 1791-1792 by a man named Wilson. Delane & Hazard built the first saw mill in 1791, and Alexander Stewart the first grist mill in 1803. Jonathan Flanders kept the first inn, and Jeremy Rockwell the first store in 1807. Colonel Gordon Conkling built the tannery at Conklingville, and placed the first steam-powered tug on the river. Benjamin Cowles was the first town supervisor.